Scroll down to see what program best fits for age and interest and then click on the program icon to learn about units in our district. If you have questions please feel free to contact us and we will be happy to assist. Thanks for visiting our webpage! 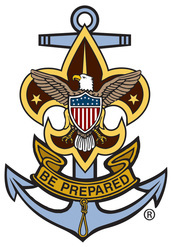 Scouts BSA Troops are for young men & young women in the fifth grade who are 10 or 11 years old through 17 years old. while older scouts have separate patrols according to age & interest of the more experienced scouts. 14 years through 20 years old. while encouraging personal development and leadership skills of each individual member. earn merit badges & rank advancements towards the Eagle Rank or for Palms until the 18th birthday. There is a brand new advancement/awards program being unveiled May 2014 for Venturing Crews. Ship members learn the ways of water travel. They plan water activities in local lakes and build up experience to take their rigs to the ocean. They have hands-on experience with leadership skills and boat/ship operations. There is an advancement/awards program geared to the tasks and responsibilities of being a shipmate.